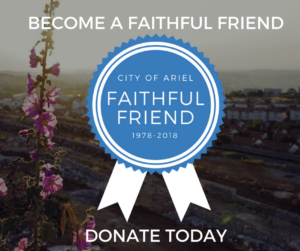 Join us as an Ariel Faithful Friend! As you may have noticed, we are now celebrating Ariel’s 40th birthday with our #40for40 campaign. And to celebrate, we’re rolling out a special digital badge of support for all of Ariel’s faithful friends and supporters! Give your year-end gift today to the City of Ariel to receive a digital badge to share with your friends and family. Love Facebook? Love the city of Ariel? We’ve also rolled out a special Facebook badge to add to your profile picture. Go to your Facebook profile photo. On the next screen, click on the “Add Frame” button. Add the “Friends of Ariel 2018” profile badge to your picture!